Are you interested in aviation and experiencing a flight in a modern light aircraft? Would you like to see the world from above and enjoy a unique flying adventure that you won’t forget? Maybe you’re a pilot with limited access to a club’s aircraft and wish to fly more often? Or how about sharing a sight-seeing flight around East Anglia? We could even share a flight over to France for a moules & frites lunch? Share a flight to an airfield near London and then you could catch a Tube into the City to do some shopping? What about a land-out to another local airfield such as Fenland, Seething, Northrepps, Chatteris, etc.? How about a longer flight to another airfield anywhere within the UK? We could even fly over your house for the perfect photo opportunity! 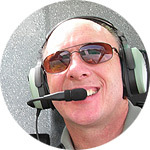 My name is Paul and I’m a flying instructor & retired RAF officer with my own modern light aircraft based near Cambridge. Due to a recent CAA Exemption & change in British and European Flying Regulations, I can offer flights in my aircraft on a cost-sharing & non-profit making basis to anyone interested in coming flying with me as a passenger. Flight-sharing is a similar concept to carpooling and is very affordable! Passengers and pilots meet up and agree to share the pilot's free seats in a ‘plane and the direct costs of the flight. 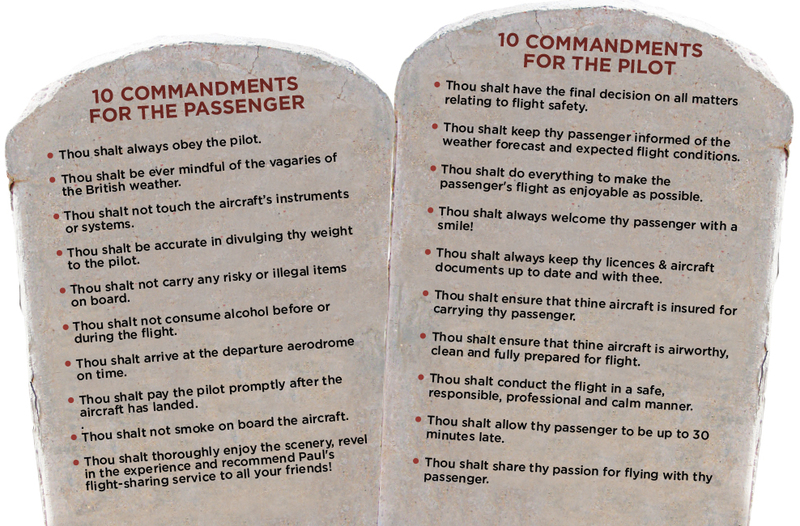 It also helps pilots live their passion fully by decreasing the cost of flying. So how does flight-sharing work with you? Simple! You decide what kind of flight-sharing experience you’d like and then you call or email me to arrange a convenient date, time & departure airfield (e.g. Chatteris, Fowlmere, Sutton Meadows, Bourn, Cambridge, etc.). I will ask for your contact details and your weight - which is an important piece of information I need to know for the safe conduct of the flight. Please bear in mind that the prospective date for the flight is entirely weather dependent. Yes, what about the weather? Weather is the major factor in deciding if our flight-sharing experience will take place or not. I will call you the day before and on the day of the flight with an update of the forecast weather conditions and whether it is safe to go flying or not. On the day of the flight, I meet you at the pre-arranged time & place and then after introductions, the mandatory passenger safety briefing and the aircraft pre-flight inspection, we go flying – weather dependent, of course! What if the weather is unsuitable on the day of the flight? If that is the case, I will unfortunately have to cancel our flight. We can then discuss postponing our flight-sharing experience to an alternative mutually convenient date. As the weather is a major concern, can I just book a flight and then you call me when the weather looks good? The cost is from £45 for 30 minutes or £80 per hour - subject to the type of flight-sharing experience you would like. You pay me in cash before we take-off for our flight. What if I have to cancel our flight? Please could you try and let me know as soon as possible your decision to cancel your flight-sharing experience. You can either cancel the experience altogether or re-schedule it for another more convenient time. Can we talk to each other during the flight? Yes, of course we can! We will both be wearing headsets enabling 2-way communication. You are actively encouraged to ask me anything you like regarding the aircraft or our flight. The only stipulation is that if Air Traffic Control need to speak to me, they have priority and you must remain silent until they have finished talking to me! The UK CAA Exemption E 4020 ORS 4 1094 dated 27 March 2015, facilitates the early adoption of the Air Operations Regulation (EU) under UK national law which allows the sharing of the direct costs of a flight (e.g. fuel, landing fees, parking charges and aircraft hire) by up to six people as per article 6.4a. European Regulation 379/2014 authorizes flights with shared expenses carried out by private individuals provided that the direct cost is divided between all the occupants of the aircraft, including the pilot, and that the number of people bearing the direct costs does not exceed six people.